July has arrived and it promises to be a beautiful week for gardening, parades, picnics, and parties. Fourth of July falls on a Saturday this year and I am taking advantage of that fact to enjoy a long weekend and recharge my batteries. For as long as I can remember, Natureworks has always been closed on July 4th. This year, a few of my employees volunteered to work this Saturday from 8-2. We have to be here to water anyway, and because I will be gone Friday–Monday, I think they are cooking something up that they don’t want me to be involved in. They are probably going to have some sort of ridiculous sale on all of our perfectly good plants that we just got in. Hmmm…. All I can say is stop by and check out all the great color we have on our benches to jazz up your gardens and containers and see below what Diane and company have cooked up to drive me crazy! We ARE closed on Sundays for the rest of the summer and our off-peak summer hours go into effect next week: Monday–Saturday 9-5. 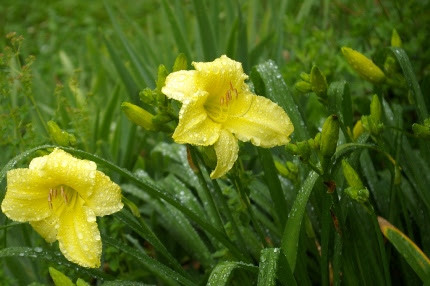 ‘Fragrant Returns’ daylily in my garden on a rainy day. This really IS fragrant and really does repeat bloom! Life giving rain has once again fallen from the skies over the weekend. My gardens are now an overgrown jungle! I walked out on Monday and shook my head in wonder- what’s a gardener to do? Well, I did quite a bit of cutting and pruning to make “windows” for plants that were suddenly buried beneath their neighbors. I found tons of red lily leaf beetles on my lilies and squished them. Man, they must really reproduce when it rains! I donned my rubber gloves and removed hollyhock leaves with rust and a smattering of tomato leaves that looked like they may be getting a bit of early blight and threw them in a garbage bag, then cleaned the gloves and tools with rubbing alcohol. This weekend I plan on seriously finishing the open pruning and staking of my tomatoes once and for all. So much needs deadheading, especially my roses. My old fashioned bleeding heart is turning yellow and needs to be cut down. There are masses of daffodil foliage to be pulled out everywhere. And then there is that ever-growing pile of plants that I keep bringing home by the driveway. Summertime flowers are opening this week. 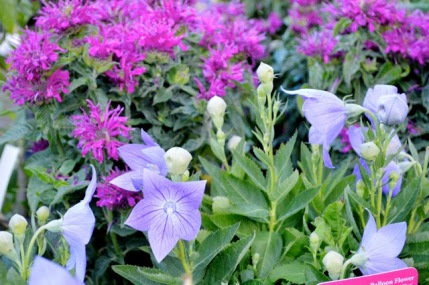 ‘Sentimental Blue’ balloon flowers (Platycodon) are great for the front of the border. They bloom twice if you deadhead them. Rain means many things to gardeners. Slugs are in abundance. We use Sluggo, all natural iron phosphate granules that won’t harm pets, birds, toads, or good bugs. Slugs come out at night and leave large chew holes in your plants. You can also trap them with shallow tuna cans filled with stale beer. Empty the cans every morning, refill them every evening. Fungus is now among us. 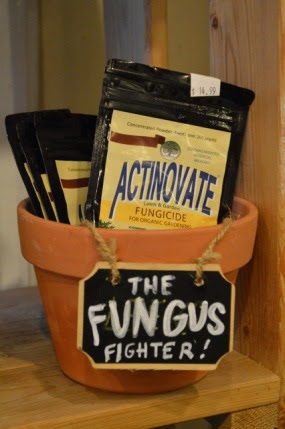 Actinovate is an OMRI certified fungicide powder that contains a patented beneficial microorganism that attacks root and foliar diseases. Foliar applications should be made every 14 days during disease time to preventmildews and molds. If disease appears, application frequency should be shortened to every 7 days or less. Rain means plants topple over. Staking of plants begins now in earnest. We have bamboo stakes and metal Y-stakes which Ilove and find really easy to use year after year. Rain also means it’s time to step up the garden sanitation. Clean off dead or diseased foliage and clear debris from the ground. Rain means it’s time to FEED your plants. Container gardens are especially in need of feeding now as regular watering leaches the nutrients out of the soil. We use Organic Plant Magic constantly on everything. We also use Neptune’s Harvest (fish emulsion and liquid seaweed mix) to add quick nitrogen and the stress-busting benefits of the seaweed. Side dress your veggie plants with Dr. Earth Tomato, Vegetable, and Herb fertilizer. Side dressing means running a bead of dry fertilizer along the side of a row of veggies or sprinkling in a circle around individual plants. 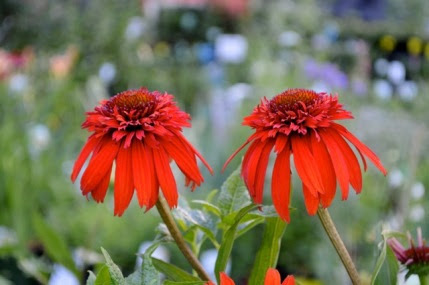 ‘Hot Papaya’ Echinacea is one of the hardiest varieties I have ever planted. 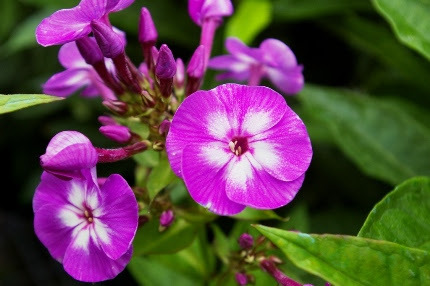 I have it in combination with orange butterfly weed in my garden at home. The classic summertime flowers are starting to flower everywhere we look. Daylilies, Shasta daisies, Liatris, Astilbes, balloon flowers- nothingsays summer and the fourth of July more than a vase filled with these perennials. 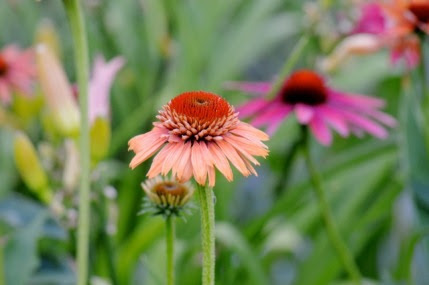 Stealing the show again this year are all the wonderful varieties and colors of Echinacea (coneflowers). At Natureworks, we ADORE this plant. It is one of the best native perennials you can grow and it is constantly covered with bees, butterflies, and other pollinators. Delphiniums, yarrows, summer phloxes, Scabiosas, roses, Asclepias, ‘Rozanne’ and ‘Azure Blue’ cranesbills are all adding to the beauty of our displays right now. 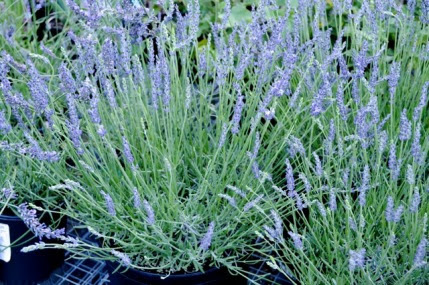 Lush lavender on our benches this week. Adding to the classic summer flowers are the classic summer bugs- including the first Japanese beetles of the season! Naturally, I started eating the first of my raspberries and spotted those nasty creatures on the very same day. I tend to get outside in the early morning and knock them into a jar of soapy water. Perhaps the many years of doing this will have made a dent in the population this year.